Ideally designed for non-invasive checks of insulation condition, the Fluke 360 Leakage Clamp Meter allows you to perform tests without powering down the installation or disconnecting equipment - saving you time, without compromising on quality or safety. The unique jaw design of the Fluke 360 eliminates the influence of adjacent current conductors, and minimizes the effects of external magnetic fields, even at low currents. This allows you to perform accurate and reliable tests in today's crowded electrical environments. 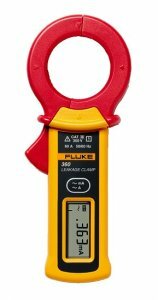 The tough and high-quality clamp design of the Fluke 360 guarantees high stability for long-term repeatability. IEC 61010 safety features including a tactile barrier and special jaw design provide the user with confidence when making measurements in hazardous voltage areas. Conformance to EMC standards ensures high reliability through reduced susceptibility to electromagnetic interference. The Fluke 360 also meets the latest safety standard VDE0404-4 and the new VDE0702 requirements. Advanced jaw design means that the Fluke 360 accuracy is little affected by external magnetic fields even at low currents. Typical external current rejection is 200,000:1.